Update, 8:50 a.m. Tuesday: Fire officials say they've made rapid progress in the last 24 hours in getting a handle on the Shirley Fire, burning in Sequoia National Forest northwest of the resort community of Lake Isabella. In its latest update on the blaze, the U.S. Forest Service says the fire is now 75 percent contained, up from 10 percent on Monday. The fire's acreage is now estimated at about 2,700, up from 2,200 on Monday. LAKE ISABELLA, Kern County — A wildfire burning near homes Monday in the southern Sierra Nevada west of California's Lake Isabella grew only slightly overnight, and crews expected to make significant progress before hotter, drier weather sets in later in the week. Firefighters using air tankers and helicopters were battling the Shirley Fire, which has charred about 2,200 acres of trees and brush in and around the Sequoia National Forest. 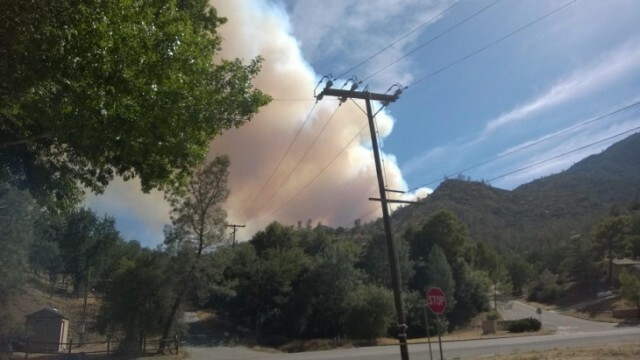 Flames came within a mile of the mountain community of Wofford Heights, and authorities called on residents of about a thousand threatened homes to evacuate. The fire has destroyed at least two structures, fire spokesman Jay Nichols said. The blaze was 10 percent contained, but officials said that number was expected to grow throughout the day. The fire broke out Friday night in a remote area about 40 miles northeast of Bakersfield and exploded late Saturday as dry winds pushed the flames toward homes, prompting Kern County sheriff's deputies to knock on doors into the night to urge residents to leave. More than 1,100 firefighters were battling the blaze in steep, rugged terrain at elevations around 2,500 feet amid a popular outdoor recreation area. Aircraft were scooping water from Lake Isabella to use against the flames. More crews were expected to join the fight. Authorities planned to keep the augmented crews working through a "swing shift" so they don't lose any time during shift changes to make progress, Forest Service spokeswoman Jennifer Chapman said. "Our current outlook for the forecast is such that we are really ramping up suppression operations over the next couple of days because it's going to be even hotter and drier at the end of the week," she said. The Forest Service said that camping, horseback riding, rafting and other activities in the Sequoia district were so far unaffected by the blaze.